As the days get shorter and cozy nights in with a good movie and your comfiest outfit (I’m looking at you yoga pants and oversized sweatshirt) become more of a regular occurrence there’s such a satisfaction that comes with turning on your oven to make a meal to enjoy and also warm your home. I know it can be a challenge – between working, staying active, and generally keeping all your ducks in a row, there’s not always a ton of extra time at the end of the day to make a healthy dinner. But it is possible, especially when there’s super rad companies out there like Simple Mills that make the whole process a heck of a lot easier. 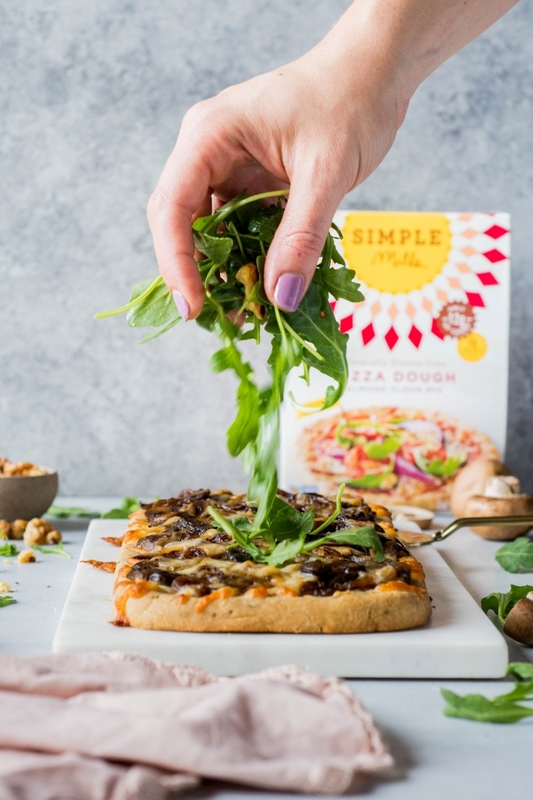 Have you guys made Simple Mills grain free almond flour pizza crust? I’m OBSESSED. It’s pretty much the best. They use only clean and simple ingredients that are gluten free, grain free, soy free, non GMO AND paleo friendly – how about that for impressive! And their almond flour pizza dough is really something special. It’s the start of a favorite grain free meal of ours that’s not only good for you but also inexpensive and super easy to make. 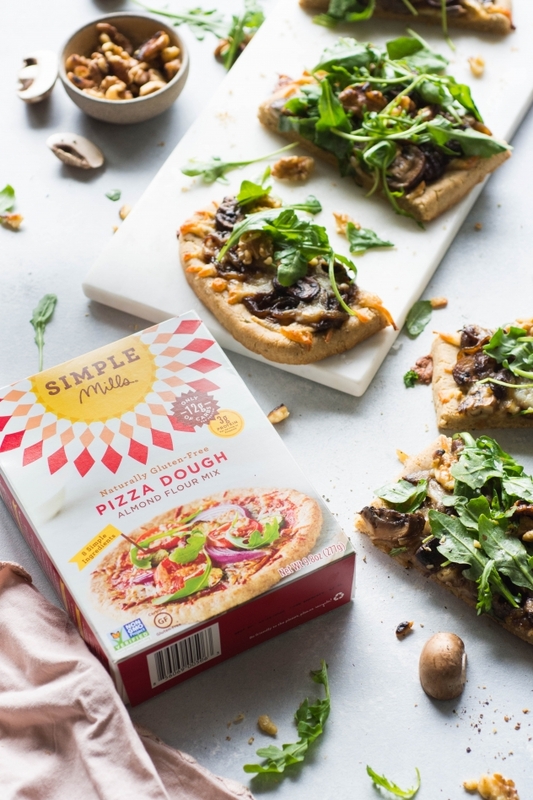 Starting with the pizza dough – all you need to add to the Simple Mills mix is a little apple cider vinegar, your oil of choice (I use avocado oil – a heart healthy option that’s also great for high heat), and some water. The pizza crust is formed and baked a bit before you add the toppings – that way it doesn’t get soggy or absorb too much of the moisture from the toppings. 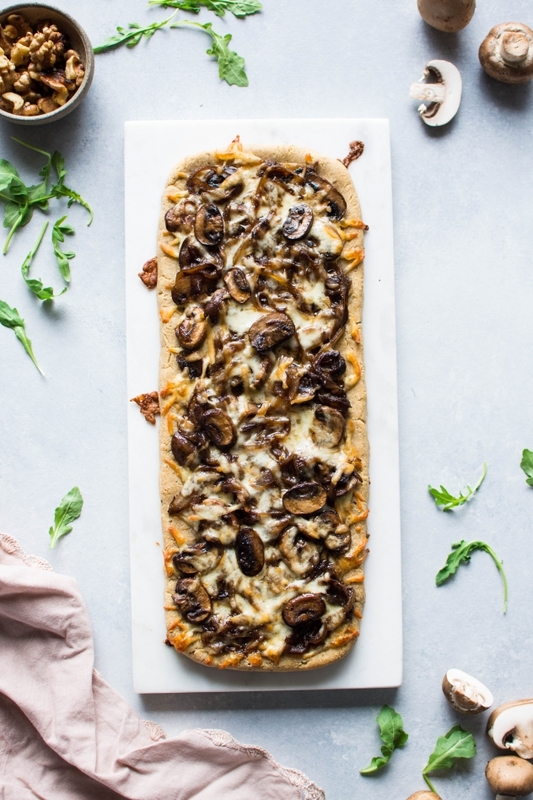 After the crust has been par-baked, you’ll layer the smoked mozzarella cheese, caramelized onions and mushrooms, and bake it again until the cheese is melty and bubbling. <– YES. 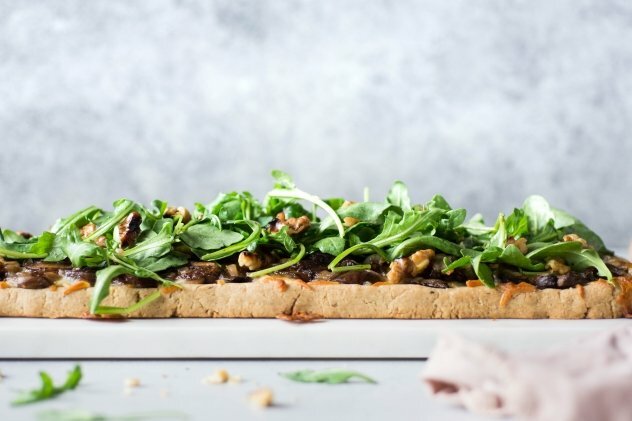 Let it rest just a little bit before you top it with the arugula and walnut salad, slice it up and DIG IN! So easy and so dang good. where can you buy their grain free almond flour pizza dough mix? Many natural grocers and even some more mainstream grocery stores sell it, but if you don’t see it on the shelves, or just want to enjoy the convenience of having it delivered right to your front door bc #lifeisbusy, you can buy the almond flour pizza dough via this link on Amazon. 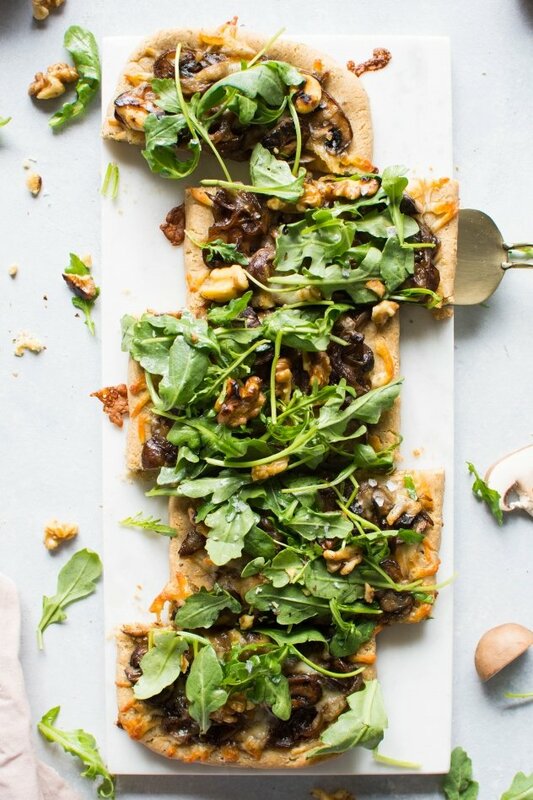 We have made pizza with their grain free almond flour pizza dough more times than I can count, but I’m pretty sure this combination of rich and flavorful caramelized onions and mushrooms with smoked mozzarella cheese and a bright peppery arugula and toasted walnut salad is my favorite one yet. 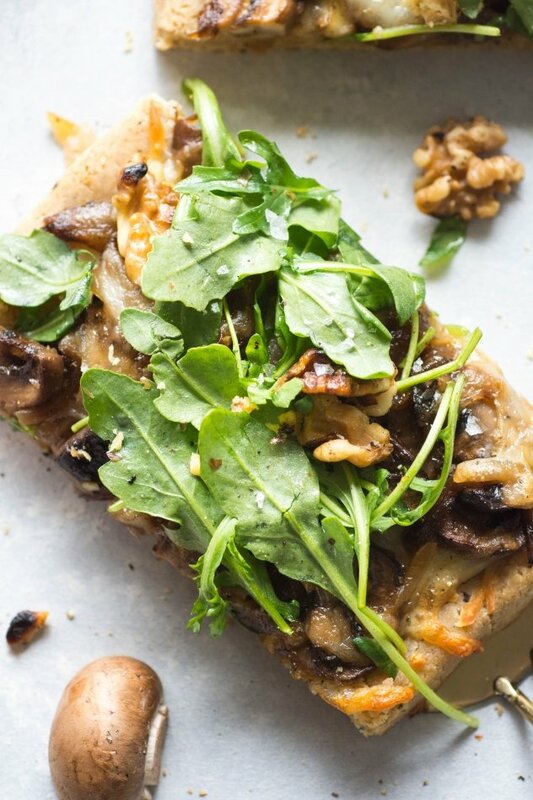 So yes, pizza CAN be healthy and crazy delicious if you start with the good stuff. This almond flour pizza mix is exactly that and I just know you’re gonna love it. This post is sponsored by Simple Mills – a clean food company that makes wholesome, convenient foods that taste great.. All content and opinions are 100% my own. Thank you for supporting the brands that help make Nyssa’s Kitchen possible! Heat 2 tablespoons avocado or olive oil in a large skillet over medium high heat. Add mushrooms, onions and 1 teaspoon salt. Cook and stir for about 8-10 minutes – until they are golden brown and soft. If pan gets too dry while you’re caramelizing onions and mushrooms, add a tiny splash (maybe 1 tablespoon at a time) of water every so often to get things moving around the pan again. Move onions and mushrooms to a bowl or plate and add the walnuts to the pan with 1/2 teaspoon of avocado or olive oil along with a big pinch of sea salt. Toast walnuts, stirring frequently, for a minute or so until golden brown and fragrant. Move to a small bowl. Next make the almond flour pizza dough. In a large bowl whisk together the apple cider vinegar, avocado or olive oil, and water. Add pizza dough mix and stir until well combined and a stiff dough forms. On a large baking sheet lined with parchment paper, dump out dough and press and shape into a rectangle. Bake for about 7 minutes – until dough has puffed slightly and looks somewhat dry. Remove from the oven and drizzle with a little bit of olive oil and it spread around with a folded piece of paper towel or a pastry brush – careful it will be hot. Add half of the smoked mozzarella cheese. Spread caramelized onions and mushrooms over the top of cheese and sprinkle with the remaining cheese. Bake for another 12-15 minutes, until cheese is fully melted and crust is starting to brown. For extra crispy brown goodness broil on high for about 1 minute <– highly recommend not skipping this step! Remove from the oven and allow to cool for a couple minutes while you dress the arugula salad. Toss arugula with olive oil, red or white wine vinegar, a pinch of sea salt, and toasted walnuts. 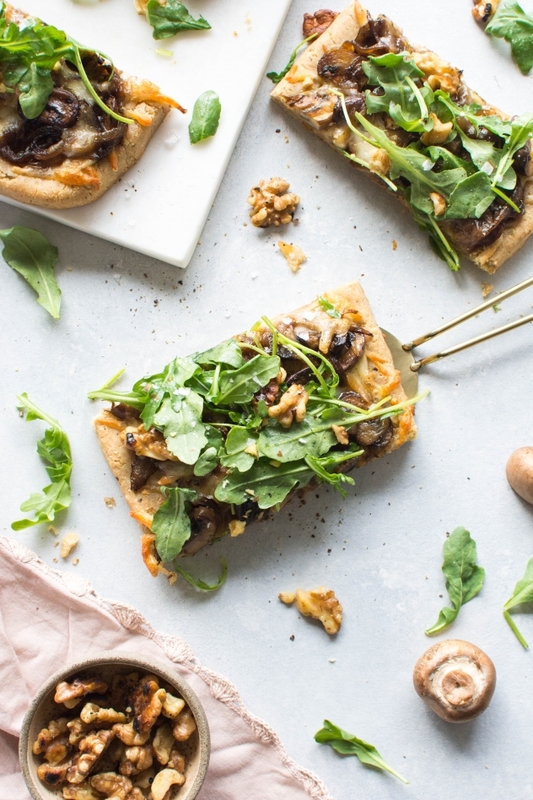 Top pizza with arugula walnut salad. Cut and serve immediately! 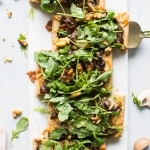 To make this pizza dairy free or vegan simply substitute your favorite dairy free cheese for the smoked mozzarella, or leave the cheese off all together – with all the flavor in the mushrooms, onions, and arugula salad – you won’t be missing out!